The ancient plough soil on the brow of the hill suggests Neolithic farming, which may have begun 7,000 years ago. Numerous Iron Age potsherds have been unearthed here and the site has accord­ingly been scheduled under the Ancient Monuments and Archaeological Areas Act – though there is no monument on the hilltop except for the modern trian­gu­lation pillar. Horsendun (as it was then spelt) was first recorded in 1203 and derives from an Old English personal name (Horsa) and dūn, which could either have meant ‘hill fort’ or simply ‘hill’ – and it is not known which applied in this case. The Victoria County History says: “Nothing is known of the partially moated site on the lower slope of Horsenden Hill … The site may be identi­fiable with a capital messuage which was ruinous in 1342.” It is presumed to have been the site of one of Perivale’s two former manor houses. 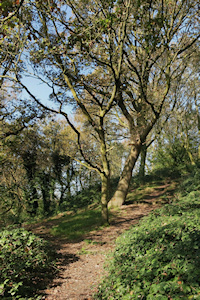 Horsenden Wood, which belonged to the lord of the manor of Greenford, lay on the northern slope of the hill. Over a period of several centuries many of its trees were cut down for timber and firewood, and the roots and stumps were later grubbed up so that crops could be grown. The Paddington arm of the Grand Union Canal wound its way around the southern slopes of the hill in the latter years of the 18th century and was formally opened in July 1801. Shown in the photo­graph at the top of the page,* Horsenden farmhouse dates perhaps from the 1860s. The hamlet of Brabsden Green lay due west of the summit of the hill beside Horsenden Lane. In the 19th century it consisted of a few cottages, a village shop and a public house, the Ballot Box, which was so called because of its use as a polling station for canal boatmen. Most of the farmland on the east side of Horsenden Hill was bought in 1920 by the newly formed Sudbury golf club. 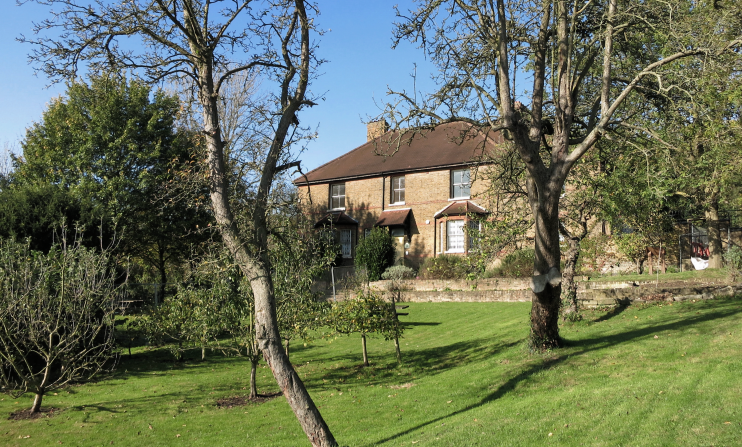 The rest was was acquired by Ealing council in 1938 as part of its green-belt scheme and the open space was extended by the acquis­ition of neigh­bouring charity-owned land in 1942. During the Second World War the western fields were used for growing wheat and veget­ables and remained in cultiv­ation until about 1950. The Ballot Box pub was re-sited in Greenford after the Second World War and the rest of the houses of Brabsden Green were demol­ished in 1970s. Horsenden East has large areas of woodland, a nine-hole golf course and small patches of grassland on which half a dozen cattle are grazed from August to November. The hill reaches 277 feet above sea level here, and the broad, grassy summit is the highest point in the borough. Horsenden West has a mosaic of wildflower meadows, hedgerows and ponds. South-west of the canal, Paradise Fields is a wetland area with scrapes, reedbeds and lagoons. * The pictures of Horsenden Farm House and the Capital Ring path on this page are both adapted from original photographs, copyright Des Blenkinsopp, at Geograph Britain and Ireland, made available under the Attribution-ShareAlike 2.0 Generic Licence. Any subsequent reuse is hereby freely permitted under the terms of that licence.